Are you one to have a difficult time expressing the emotions you feel in writing? Well, let me tell you something…you’re not alone! There are so many people that rather express what they feel in actual spoken words, but sometimes having that little unexpected note makes the occasion even more special. So, here are a few card message ideas you can use to accompany the floral piece you choose to send this month! Are you a flower enthusiast? If you are, here are three flower events in the fall that you should know about! Grab some of your friends and plan a trip to see some beautiful flower displays. This garden show is perfect for families! The Phipps’ Summer Flower Show: Playgardens comes alive with the colors of summer with each room offering interactive features. The Summer Flower Show runs through October 2. Admission is $15 for adults, $14 for seniors and students, and $11 for children (2 – 18). Members and kids under 2 enter free. Visit Phipps PlayGardens website to learn more about their Summer Flower Show and how to plan your visit! This year seems to have flown by. Can you believe it will be October in just a couple of days? For October, we’ve chosen Fall Treasures to be our favorite flower arrangement of the month. It’s the perfect arrangement to discover the fantastic flowers of fall. Sunflowers, roses, carnations, and snapdragons – all in the harmonious hues of the season. Fall Treasures can be sent to yourself or a friend as a little pick-me-up to get a jump-start on the fall season. I know what you’re thinking, “I can’t send flowers to myself..” Of course you can! Sometimes it pays to treat yourself once in a while, especially before you jump head first into the upcoming holiday season. Of course, sending flowers to a friend or loved one is almost doubly rewarding. If you know someone who could use a fresh start this fall, why send this arrangement and let them discover Fall Treasures for themselves? Just remember, always always ALWAYS use a local florist when sending flowers. If you don’t know the local florist in the city you would like to send flowers, use our handy florist finder to find them directly. Fall is the wonderful transition from the sizzling summer to ice cold winter; the time when the weather is just perfect. It’s almost like a second spring that’s even more beautiful: with flowers blooming and colorful trees turning their autumn colors. Overall, it’s just a wonderful season to be celebrated while it lasts. Before the 16th century, harvest was the term used to refer to the season. However, as more people moved away from farming to living in towns, the word harvest lost its reference and came to refer to only the actual activity of reaping, and autumn, as well as fall, began to replace it as a reference to the season. Although we do not call it harvest anymore, we still use many references from harvesting in our fall decor: cornucopias, wheat, gourds and pumpkins, corn, hay, etc. Fall is arguably the favorite of all seasons. Everyone loves the colors of fall and seasonal decor during this time is a MUST in most homes. You will see hay, pumpkins scarecrows as yard decor all season. Some of our favorite holiday parties happen during fall: Halloween & Thanksgiving. Halloween pumpkin carving is a favorite fall activity that dates back to the 1700s and Thanksgiving is all about celebrating the bounty of fall. American Football also gets everyone together for a party. Long fall nights are made for spending time indoors with family and friends. And with fall right around the corner, now is the time to start thinking Autumn colors! You want your rustic-themed bouquets and flower arrangements to look effortless, chic and natural. Organic colors will blend perfectly into your fall wedding. Using the above fall accessories, you can create an organic, chic rustic-themed bouquet. These simple, easy to find accessories will compliment any wedding ceremony. Textures make a huge impact and by creating a floral design with these alternative accessories you are sure to express your creative spark in more ways than one! Your local florist can create the prefect wedding bouquet for you. Or if weddings aren’t on your horizon, opt for a beautiful arrangement of fall flowers instead! Same principles apply! For more wedding photos, visit our sister site Wedding & Party Network’s galleries. Upcoming color trends for the 2010 fall season are all about using new and exciting colors. Now, I know what you’re thinking… falls colors have been the same forEVER! Reds, oranges, yellows, browns… Don’t get me wrong, those are very fun colors to use, but this year add in accent colors like lime green, magenta, or orange cream. Check out these great palettes, get inspired and start planning your fall season! Fall wedding flowers burst upon the scene in a kaleidoscope of colors. Paint an idyllic wedding picture on this fall’s canvas when using a rich palette of the season’s colors. Whether the celebration takes place during the sun dappled day, or in the crisp autumn air of evening, the fall wedding introduces a season of excitement. September, October, and November bestow bright flowers and abundant foliage – just the right ingredients for a fabulous fall ceremony. Deciding on the type of fall floral arrangements will often determine the style of wedding. Consulting a professional florist can be of invaluable help when considering the theme and cost of the wedding. Don’t hesitate to convey what you envision for your wedding along with a review of your budget. When meeting with your florist, it’s wise to discuss the size and location of your wedding and reception. And, don’t forget to include the number of attendants and guests. It helps if you provide your favorite wedding photographs, color preferences, and fabric samples when talking about your ceremony. A professional florist can assist in creating a plan that helps you to make informed decisions, which can save time and reduce stress. The fall season lends its self to vibrant colors. When selecting fall wedding flowers consider the colors of: Yellow, Gold, Bronze, Orange, Red, Dark Pink, Burgundy, Rust, Brown, Purple, Egg Plant, Green and Tan. Although the types of wedding flowers are usually chosen by the bride, the color palette of the flowers are often determined by the color of the bridesmaids’ dresses. A professional florist can explain your floral options. Discussions will include the difference between selecting flowers that are in season, as opposed to choosing flowers that are out of season. Out of season flowers increase prices significantly. ROSES (Rosa) – Many people tend to think of roses as either traditional red or delicate pink. However, the colors of roses range from gold to chocolate. Brides may want to consider the radiant rose colors that include golden apricot, tomato-red, deep yellow, red-orange, tangerine, dark burgundy, coral-orange, burnt- orange, or chocolate brown. These striking shades make beautiful wedding bouquets, floral decorations, and arrangements. DAISIES (Gerbera) – There are a number of varieties from a single petal to a double petal. 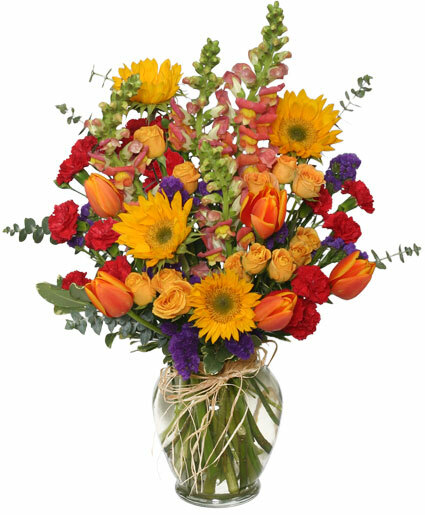 The bright colors and varying sizes of this flower make for beautiful bouquets and eye-catching arrangements. SLIPPER ORCHIDS (Paphiopedilum spp.) – This fall flower’s colors of brownish red, green and yellow can set the seasonal tone. CALLA LILY (Zantedeschia) – The “green goddess” has deep green leaves and generous blooms. This is a sophisticated flower that often stands on its own. Not only do calla lilies come in the traditional white, but they also come in the rich and beautiful shades of cream, yellow, burgundy, and bronze. GLORIOSA LILIES (Gloriosa rothschildeana) – A glorious bloom that makes a bold statement. The strikingly curved petals in lustrous red will certainly turn heads. ORIENTAL LILIES (Lilium Oriental) – Versatility is the key. Colors include white, cream, yellow and burgundy. One of the most famous hybrids is Stargazer, which has a white background with reddish/pink markings and dotted throat. HYDRANGEAS (Hydrangea quercifolia) – The late blooming Oak Leaf Hydrangea gets its name from the shape of its large leaves. These beautiful leaves often turn colors of brilliant yellow, orange, red, and burgundy. SUNFLOWERS (Helianthus annuus) – When you think of autumn, picture the Sunrise Sunflower. The medium short deep double yellow petals and dark center make an excellent choice for use as cut flowers that have a long vase and arrangement life. CHRYSANTHEMUMS (Chrysanthemum indicum, Chrysanthemum x morifolium) – The word chrysanthemum is taken from the Greek, chysos (gold) and anthos (flower). This fall flower is generally found in the following forms: button, daisy, decorative and spider (or quill). The size, color, height and time of bloom make it one of the most popular fall flowers for bouquets and arrangements. BABY’S BREATH ( Gypsophila paniculata) – This is the delicate name for the “work horse” of arrangements. Colors range from white to pink to blushed purple. Baby’s breath can be coupled with flowers and greenery to create fullness and depth or stand-alone in an interesting container, or elegant vase. Fall wedding decorations can be more than colorful cut flowers. A medley of textures such as beautiful berries, fall foliage, and autumn accessories create the look of a bountiful harvest. Consider the use of berries when decorating tables, window ledges, archways or columns. Cuttings from fall foliage make stunning centerpieces and arrangements. Don’t forget autumn accessories add interest. Continue an autumn atmosphere your guests will remember by considering the following areas for decoration. These locations may be enhanced by the use of flowers, berries, foliage and accessories. THE WEDDING CEREMONY: The altar, columns, candelabra, backdrop for the ceremony, archways, podium, for Jewish weddings the chuppah, the aisle, end of pews, communion rails, vestibule, guest book table, doors leading to the sanctuary, and stair rails outside the entrance. THE RECEPTION: The entry area, place card table, buffet table centerpieces, table arrangements, head table design, free standing decorations, candles, stage decor, wedding cake and cake table and restrooms. The wide variety of fall wedding flowers and large array of berries, foliage and accessories make autumn a wonderful time of year for your special celebration. Whether your theme is large and elegant, or intimate and casual – let a professional florist customize an unforgettable fall wedding for you! Photo by C & C Sensations, a local florist in Waynesboro VA.
Find a local florist to help create your fall wedding flowers. Planning a wedding? Check out Wedding and Party Network for all of your wedding needs.